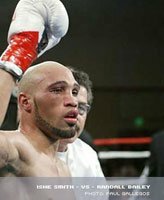 Check out this interview with Ishe Smith as he talks about his career and the time he spent as a participant on the 'Contender' series! [ Q ] What do you do better now than before in your career? A: Once you become a pro you have to adjust. As an amateur you&apos;re used to shorter rounds, such as 2-minute rounds. As a pro the rounds are three minutes and you sometimes go 12 rounds. As a pro you have to learn to adjust, pace yourself, and be patient. 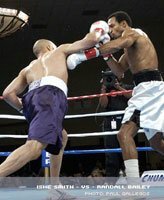 From The Randall Bailey Fight. [ Q ] Does strategy play more in the pro bouts? A: Yes, you definitely need a good strategy. You also need to pace yourself, be patient and take your time. In a 12-round fight it adds up to 36 minutes of high cardio in the ring, 48 mins total. That&apos;s such a long time to be in the boxing ring, with a high cardio output, it fatigues your body and mind. Your muscles are tensed the entire fight. 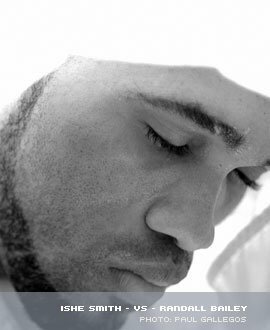 You are always thinking your nerves and adrenaline are going, and you&apos;re completely drained after a fight, you experience total exhaustion. [ Q ] Do you have any fear? A: For the most part you get used to getting hit, you don&apos;t like to get hit; you have to have a little fear. To me fear and being scared are two different things. You might be scared of the neighborhood bully but that fear is something different, you can have the fear of losing and it can motivate. You shouldn&apos;t confuse fear with being scared; there are a lot of scared boxers out there. Fear is good and it definitely plays a part in a boxer&apos;s life. [ Q ] Did you start boxing when you were 12? A: I started boxing when I was 8 years old. [ Q ] How did you get started so young? A: My mom took me to the gym, her friend was into boxing and I was a little kid getting picked on in the neighborhood. [ Q ] Then you didn&apos;t get picked on anymore? A: Not really, but there were still some knuckle heads that wanted to try you out because you&apos;re a boxer. I ended up falling in love with the sport, the oneness of the sport, and how fans embrace you and only you is what really drew me to the sport. The quality of being united into one. 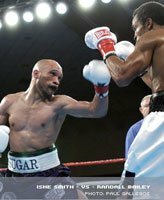 [ Q ] I see that you won 10 straight Nevada State Golden Gloves titles, is that true and is that a record? A: I don&apos;t know if it&apos;s a record because I started as a little kid and won little titles as a little kid so I don&apos;t know if it is cuz you have so many kids in Nevada for their weight classes and they win so many awards. I&apos;m very proud of my amateur career. [ Q ] I see that you had an amateur record of 100 wins and only 17 losses, what has been your career highlight to date? A: Making the 1996 Olympic trials at the age of 17. [ Q ] Take me through a training week for you? A: Waking up at 6 a.m. I eat a small breakfast then go running at 7:30 a.m. Next is speed work and jogging with my conditioning coach, then I come home and down all of my supplements and protein. From that point I go to the boxing gym, for about 3 hours. When I get home at about 1:30 p.m. I take a 3-hour nap then go to the gym to do weights. Later I go home, shower, and get ready for bed. I pretty much do that everyday. I train really hard. A lot of boxers don&apos;t train that hard and don&apos;t do that many workouts. I have a good team in place. I even have a good chef in place. We take my career seriously. I&apos;m training 3 times per day and it&apos;s tough, and it&apos;s really the first time in my career that I&apos;ve trained like this. [ Q ] What supplements do you take? A: I take whey protein and multi vitamins. I like these because they use the best ingredients for your body. People always think I&apos;m on steroids. I get drug tested a lot; both randomly and right after fights. I also get tested after every big fight. I&apos;ve never failed a drug test in my entire life. I&apos;ve been tested 3 times since I became a professional. I also got tested before I went onto the contender. [ Q ] I see that you&apos;ve trained with guys like Oscar De La Hoya, Fernando Varges and Shane Mosley. What are things that each one of them taught you? A: From Vargas I learned heart, because he gave me a lot of heart from our sparring sessions, they were so hard, I learned that I could deal with anybody. 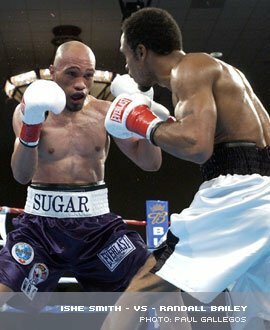 From De La Hoya he made you think a lot, so it wised me up a bit, he made you think a lot, you really had to be on your P&apos;s and Q&apos;s.
For Mosley, I was pretty much on my game and I thought I could deal with anyone, he has real fast hands. [ Q ] Is it true that you are a Chicago Cubs fan? A: Yeh, man, I stick with them through thick and thin. [ Q ] How did your training differ when you went onto the show, and your diet? A: There was a lot of TV demand, so it was hard to stick to a regimen; I&apos;m a very regimen-oriented guy. I like to have things fall in order, but it wasn&apos;t always possible, we had to do interviews and travel to different locations to do the challenges, so I had to try to get in workouts when I could. I really had to adjust to only going 5 rounds when I&apos;m used to going 8-12 rounds. You really have to come out faster and you don&apos;t have time to get settled into a fight. [ Q ] Who do you think will win? 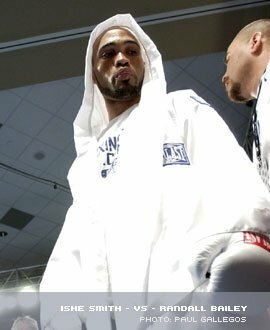 A: Alfonso Gomez, I think he has the heart and is a great fighter; he surprised a lot of us. [ Q ] In episode 9 it looked like you had won the fight, but one judge had it scored 5 rounds to 0 for Sergio, were you aware of that, what did you think? A: Yeah, I mean - being an athlete you leave everything you have in the ring and going into that last round my corner told me it was 2-2 and I needed to close the show and I felt like I had done that. I hurt him in the last 10 seconds and he could barely walk back to his corner and to find out a judge had scored it 5-0 I was totally appalled by that. I know that I gave it 110% and I made my wife and family proud and to have one incompetent judge score it that way, what could I have done different. I mean he came to the fight and must have thought this guy is not winning the fight; I mean how could he ever score the fight 5-0. I guess that&apos;s why I wasn&apos;t so hurt because it was not a split decision right down the board, but this judge scoring it 5-0 ... made it easier for me because I know that something was wrong. The crowd was booing and one judge even had me winning the fight. Who Should Have Won The Episode 9 Fight Of The Contender? Ishe Or Sergio? [ Q ] Sugar Ray made a comment that you looked frustrated at the end of round 4 is that true? A: No, I wasn&apos;t. Sergio has his style, and you have to adjust to it. You need the rounds to adjust and in those fights you don&apos;t have the time. I&apos;m used to going 10-12 rounds; I just didn&apos;t have enough time. I started out slow, probably gave up the first round. I thought I won the 2nd and 3rd, Sergio probably took the 4th and I thought I did enough in the 5th to win the fight. One judge thought so too, it&apos;s just one incompetent judge scored the fight 5-0 and it just eases my mind and lets me know I did everything short of knocking him out to win the fight. I have a lot of respect for Sergio and he&apos;s the only one I can really accept losing to. He deserves everything that he gets; I wish him the best of luck. [ Q ] How was it hanging out with Sugar Ray and Stallone? A: Ray just being smart, Ray was such a great fighter and great champion and did so much for the sport of boxing. And Stallone his presence helped us out a lot. I learned a lot from those guys. [ Q ] What are your plans after boxing? A: I&apos;ve always wanted to play football. If I am in boxing a few more years, I may try out for some type of football somewhere, be it the arena league, just to say that I did it. Maybe open up a few businesses and call it a career. Thank you all for your support of The Contender series and my career. This is a note to inform all of you that the Contender Finale has not yet taken place. It is going to take place on May 24, 2005 at the fabulous Caesars Palace Arena. On May 8, 2005 at 8:00 p.m. EST, you may begin voting for me to participate in the Fan Favorite fights for May 24, 2005. The title of the show will be "The Battle for Bronze" and "Fan Favorites Bouts". I am counting on all of you to be able to represent Las Vegas and all of my fans from boxing and The Contender. You the fan will be in control of who comes back to fight in Las Vegas, and I hope that I have done enough to prove myself to you as a fighter, and person, for you to vote as many times as allowed for me and my family to have one more shot at this Contender series. I do not take it for granted, the position in which my family and I have been placed. I appreciate all of you visiting my site, and I hope that you all exercise your right to vote. The vote will be on YAHOO ONLY at www.contender.tv.yahoo.com.